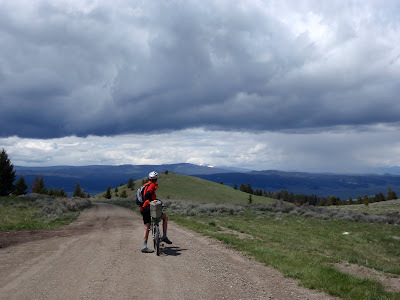 Montana is a big state on the Great Divide Mountain Bike Route - 695 miles. Very few of those miles are flat. 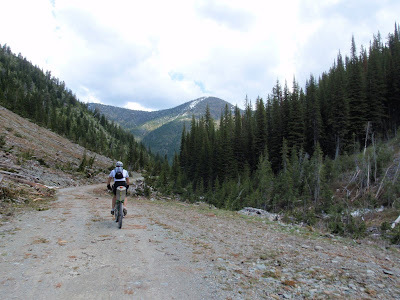 Montana is one climb after the other, and it quickly feeds you a salty dose of reality. Gunning for an average of 100 miles a day really is going to mean 10-16 hours of solid riding, day after day after day. And what that means for your body and mind, you're still very unsure. I was chowing down a huge sandwich and several cookies at the Eureka Subway when John Nobile walked up to me looking rather dejected. I didn't recognize him at first because I had only met him briefly at the race start, and, knowing he was aiming to break his own course record, really didn't expect to ever see him again. Plus, cyclists put on their helmets and shorts and they pretty much all look the same. Anyway, after several minutes of awkward questions that revealed that I didn't know who he was when I really should have, he told me he was feeling sick and had blown his knee in Canada and his race was over. As I finished my lunch, we talked about the route and he decided to put in one more day. I told him I was aiming for Whitefish and he said I could at least make it to Columbia Falls. 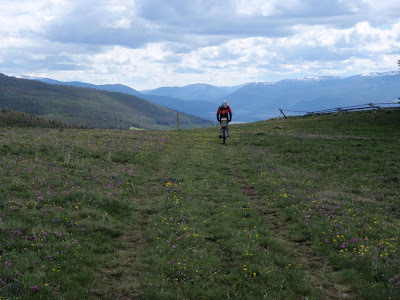 We decided to ride together to town, and over the course of the day he discovered that the world of the mid-pack Tour Divider, with its leisurely lunch stops, friendly chats with locals and remote blogging over coffee, was actually pretty enjoyable. He decided to stick around a little longer at "tour" pace (i.e. my race pace) and see if he could recover his knee enough to start hammering toward the front. It worked out pretty well for me - like having a Great Divide coach, along with the added benefit of company during the hard times and friendship during the good. We made a somewhat strange team - him with his "go go go into the night" mentality, me with my "let's stop and stare at this pretty waterfall even if the rain is bearing down on us" mentality. But it worked oddly well. Balance and flow. 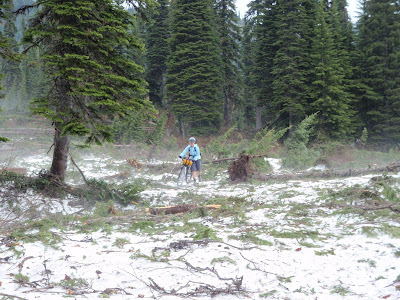 We hit our first stretch of snow at Red Meadow Lake. 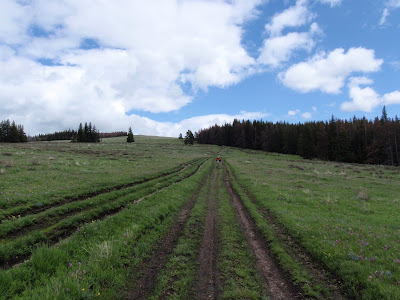 Snow and bears are fairly prevalent in Montana and widely feared by Divide racers, but in my opinion the mud and dogs of New Mexico are much more scary. 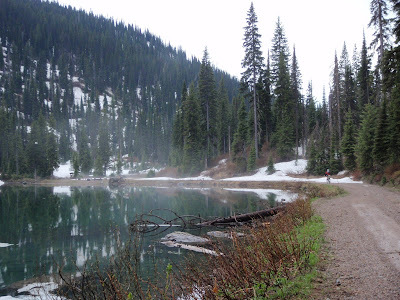 And, anyway, those snowy passes take you to misty clear lakes high in the mountains. How could you be grumpy about that? It was handy to have John around for Montana bear country. 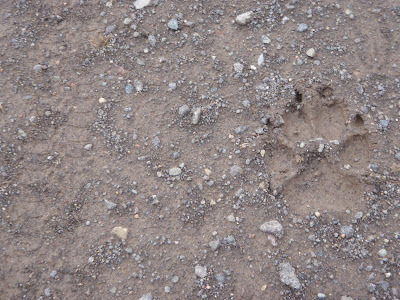 I think our total count was five bears - two grizzlies and three black bears. Whenever I saw one, I'd slam on the brakes while my heart raced. His reaction was to charge toward them while yelling. Lucky for him, they always ran away. 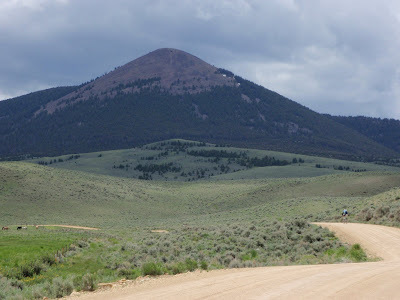 My favorite climb in Montana turned out to be Richmond Peak - steep gravel up, snowy slog down. Actually, the real reason it was my favorite climb is because it was peppered by a gorgeous sunset. 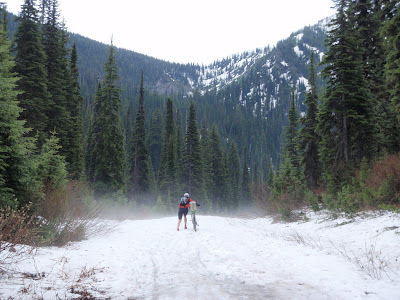 Moments like these, quiet moments of euphoria amid the labored breaths and sweat-soaked haze of a hard day's effort, are what make ultraendurance rides all worth it. Then the next day, you wake up and do it all again. And suddenly you find yourself over the next pass, across the next valley, 100 miles down the route, breathing in new climates and soaking in new sunsets. But there are always more clouds on the horizon. 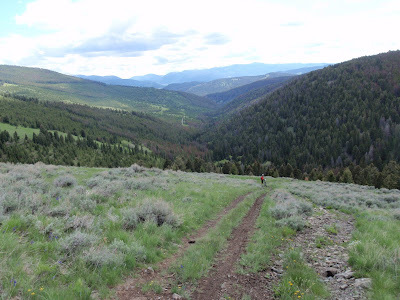 Looking out from one pass to our next - the much-feared Lava Mountain trail where crazy hillbillies roam and Divide racers get hopelessly lost. And then nosedive off the boulder-studded face of a veritable cliff. 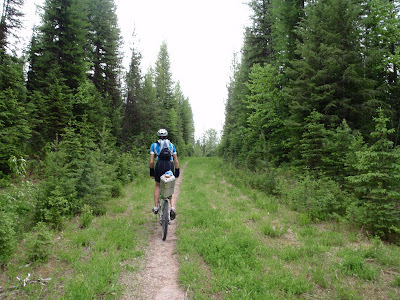 People with my technical skills call this "downhill hike-a-bike." Montana is an easy state in some ways - there are a fair number of service stops at useful intervals, and lots of water. John and I tended to eat almost exclusively from gas stations during this stretch, and my diet soon consisted of four food groups: Snickers Bars, Sour Patch Kids, M&Ms and cheese. I was putting down 4,000-5,000 calories a day of mostly this stuff. You'd think I'd just drop dead of toxic shock, but for some reason I didn't. Climbing the paved pass out of Wise River. I'll never claim to be a mountain bike snob. 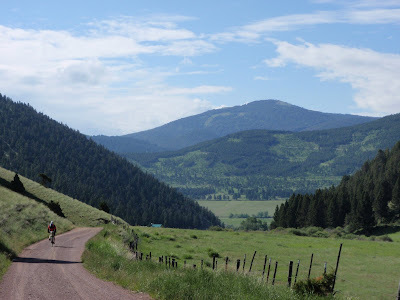 I'm really more of a bicycle tourist, and I always enjoyed the paved stretches of the route for their easy speed, smooth rolling and scenery that I actually had the handling freedom to stare at. But I like touring dirt because of the places it can take me. 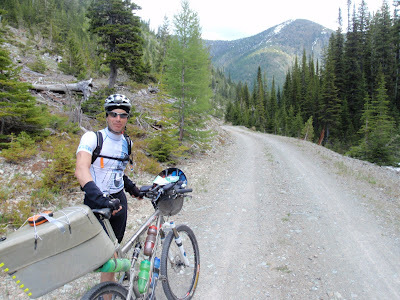 Plus, the climbs are usually more challenging, the descents more fun, and the days more rewarding. So many times when I was mired in mud, I'd promise myself I would never ride anything but pavement ever again. But I never actually believed it, even as I stood ankle deep in peanut butter sludge. 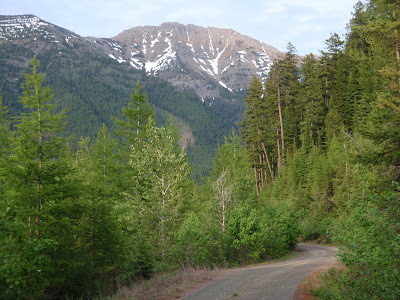 Cabin Creek Road. 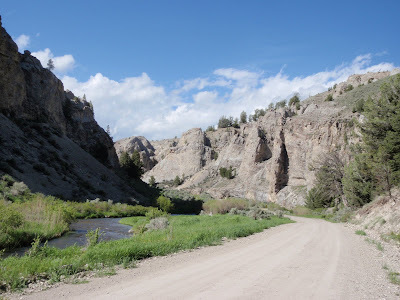 Many of these places in Montana felt so wild and remote, although even more extreme wildness and remoteness had yet to come. The drop into Lima was a really fun descent. 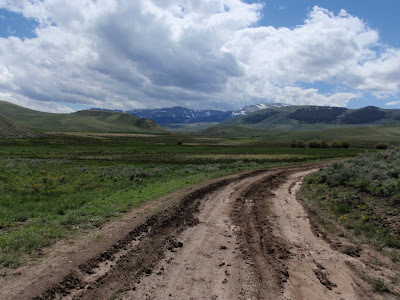 I accidentally riled up a group of four cows and continued to coast behind them as they sprinted wildly down the road for a quarter mile before finally veering off. I felt like I was driving a stampede. The next day out of Lima was gray skies and solid rain. Our maps said "roads may be mucky when wet." Mucky seems an unforgivably tame term. Impassable is a better one. There was one half-mile stretch of that horrible road where I couldn't even push my bike through the shallow canal off to the side. I simply had to hoist it as I trampled through the brush - because my feet stuck to the road as badly as my mud-cemented wheels did. Meanwhile, mosquitoes swarmed me as I pumped through the last remaining droplets of bug spray. Miserable, frustrating, temper-tantrum-inducing - these, also, are too-tame terms for such a situation. The mud can quickly remind us that we have friends in high places. 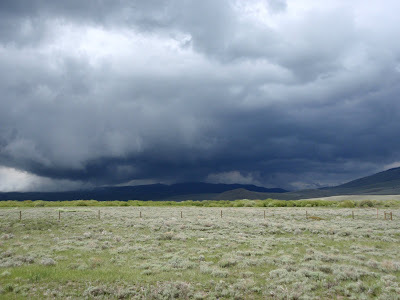 This last day out of Montana was also the day I was pummeled by a violent thunderstorm. 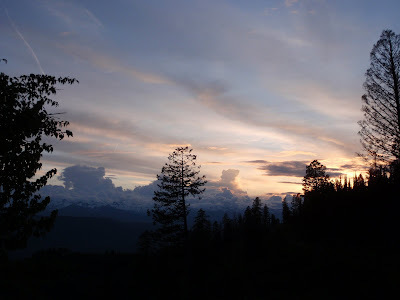 It caught me completely by surprise - ink-black clouds rolled over the mountain and showered me with lightning. One bolt hit so close that I heard no delay between the light and thunder - just a blinding flash of white in my peripheral vision surrounded by a deafening boom. 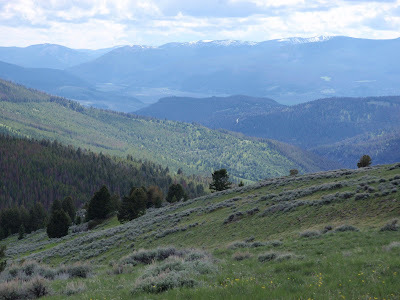 I convinced myself I was within feet of being hit by lightning in this open valley with no shelter. My only solution was to lay into the pedals and sprint with everything I had, mud and all. With hot adrenaline coursing through my veins, I believe I hit some of my high speeds for the trip on that flat, muddy stretch of road. 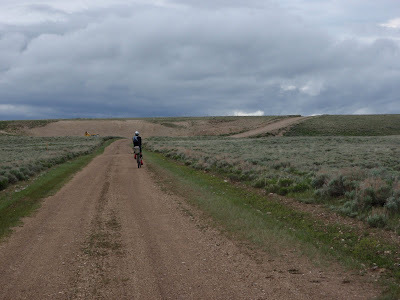 We crossed into Idaho with nearly 1,000 miles of Great Divide riding behind us - wet, cold, muddy, sore and tired - but for some strange reason, still raring to go. 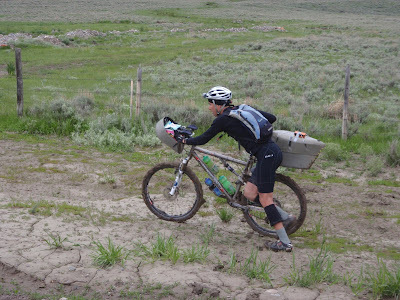 Jill, congratulations on finishing the Tour Divide. You were the first woman to finish, right? 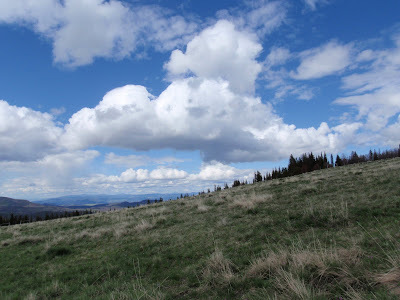 Your photos and words in this post about Montana are beautiful. 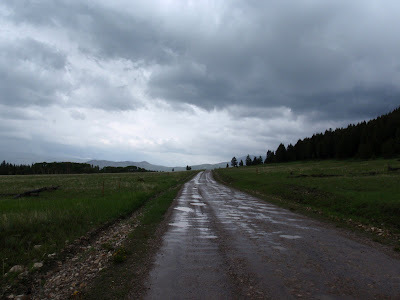 Poetry in the mountains, rain and gravel trails. Hi Jill, congratulations for your blogg and adventure, from Spain i invite to you to visit my blogg. Great photos and insightful descriptions. Loving the story and kinda jealous. Congrats on your finish. And yet, for all that open remoteness, the hand of man is still everywhere. Someone cut the trail, or built the road. Someone put up miles upon miles of fenceposts. It's heartbreaking beautiful - you seem always to find those places to ride that are awe inspiring landscapes. Great story, and fantastic photos. Keep it coming! Thankyou Jill. Engrossing story. Beautiful photos. Fantastic stuff, wonderful images. Gives me goosebumps. 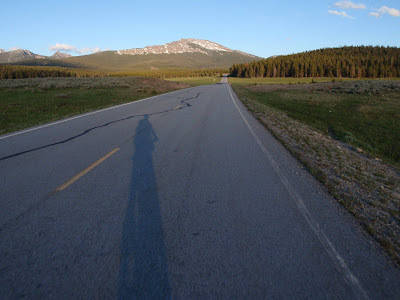 And this line, "And suddenly you find yourself over the next pass, across the next valley, 100 miles down the route, breathing in new climates and soaking in new sunsets." Poetry. Yeah baby! Great riding and great reporting. Congrats on your finish. I love the narrative of your ride....Keep up the good work. congratulations Jill! on your awesome finish...we were on the edge of our seats (and still are)watching everyones spot dots move across this great big country, knowing full well that your pain was our entertainment. 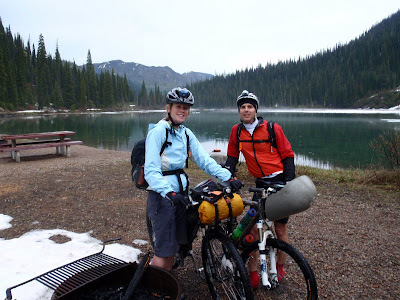 Jill, I loved our comment on how life was so much simpler on the bike. I am looking forward to some touring for just that reason, a vacation from the every life stuff. I have been reading your blog for some time now. I have always been impressed with your talents but I think now you are really maturing as a cyclist and writer. 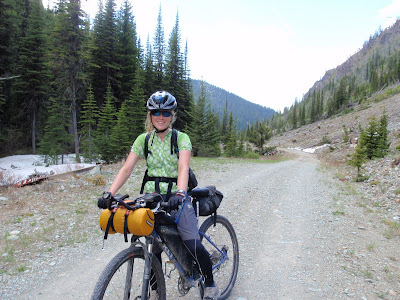 Your Tour Divide accomplishment will lead you to so many great things. I just want to thank you for sharing it with us. Thanks for sharing and I look forward to the rest of your story. I have always wanted to do this ride and now I can at least get an idea of what I hope to do in the future. 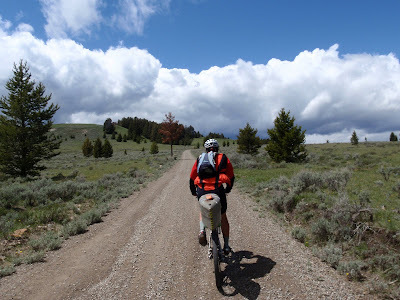 If I may ask, what was your favorite section of the trail and if you could do only one state, which one would it be? Bears.......grizzlies none the less! And here when I saw you were up around Glacier, I kept thinking of the Bears you might see up there, and around Yellowstone area. 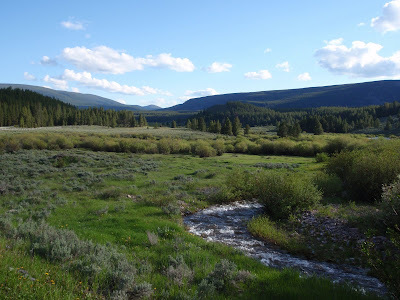 Thats my vacation back yard, not biking, but hiking and flyfishing. Two things scare the hell out of me when fishing the west.....Grizz's and rattlesnakes. I guess I am just a wimp. He rode directly toward the Grizzlies yelling? Even though I know I couldnt outride them, I would be riding the other way! Tell me one or both of you had either some major pepper spray, or a 44 magnum! I have had 3 run ins in 30 years or so, and they scared the hell out of me enough I usually stay out of the REAL back country, that you were in. Jill, you are a braver person than I am fer sure! Oops, forgot the most important thing. BEAUTIFUL pics, and wonderful narrative as usual. I am so impressed with your accomplishment. Fantastic post. I've been reading your blog for a long time, and for some reason, this one really hit home. Congratulations on finishing! Great read Jill, I am so envious of the experiences now flooding your way, keep at it, and keep telling your story. What an adventure - thank you for sharing! 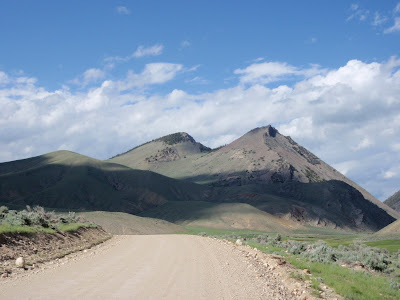 I read your "Montana" post, but what drew me to your blog was the title to your blog, "Up in Alaska"
I grew up in Alaska and Montana, its nice to read about my favorite places. I enjoy your posts.